This is a wiki, so please edit it and add to it where you see a need. Initial writeup by @hazem. Note: The following Calendar is subject to changes according to flight confirmations, project coordination. Scroll the table horizontally to see all content. In this section we can introduce ourselves as people of the openvillage, Please say a little something about yourself, what brings you here, what do you expect and want to learn, and what can you offer for the community. short bio : Urbanist, knowmad, interest-based learner. will be working on : Care for the people and projects around, contribute to BitCut and documenting the whole experience. offers : whatever help you need during your stay personally or on a project level, I am here for you, discussions on bottom-up development. short bio : economist, runner, committed citizen, proud European. will be working on : my thesis, 90%; optical coffee sorter, 10%. wants to learn : anything technical. offers : some network science and modelling. For the hosue, cooking, cleaning. The 1st Floor contains 3 rooms, each can fit 2 person. a big living room can act as a good coworking space, shower , toilet and a kitchen. Plus a Big Terrace. The ground floor has 3 separate studio apartments with a bathroom each, and we can use two of these. Each can hold around 3-4 persons. A big terrace, nice roof with ocean view, swimming pool, a garden, and a non-functioning hamam (it needs some work to be fixed). The house could be adapted for several uses depending on the people inside. We have several options to transform the space to working spaces. The big main living room. This is considered the main coworking space. It is located in the 1st floor so for it is preferred for the ladies to use the studios downstairs for more privacy. The big terrace. Could be used as a semi outdoor working space. The space is easy to adapt as long as the weather is fine, just bring the chairs and table and you have a nice small space for a team. It is in the shade so you can work with laptops during the day with the pool and garden view. The shaded outdoor space. It is located behind the southern facade of the house, quite nice space for a working space or a workshop. The space by the pool. The space could be used as a coworking space; There is a shady place for a big table by the solar panels. The roof. When it is not windy, and still needs more shading to fit a space enough for a small group. This very document here is the main wiki for the House. It will list the main / strategic tasks for every month and we can and discuss them here in the comments section. Here is the dynalist for all tasks (House and projects). It contains sub-lists for projects, for example the coffee sorter dynalist. 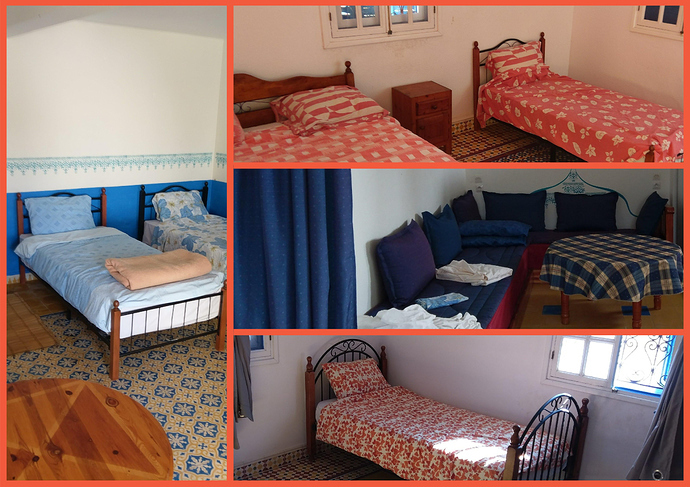 During the first week (5-12 Jan) we need to prepare the house to fit our needs, meaning getting an internet connection, preparing the sleeping areas to be gender separated, and preparing the working area. Getting to know the local community and find a carpenter who is willing to join the project or who is willing to allow us to rent/use his workshop and tools. Then start working on the following projects (starting date 15th January): coffee sorter project, surf boards, storytelling / documentation. Preparing to launch the Mesh network project by gathering the interested people from the local community and finalize the planning done in Riot including securing the equipment needed. no Carpenter but we got in touch with someone who has a CNC in Essaouira which we can rent. we asked for a 3d printer to be borrowed/rented from Casablanca but still no replay about this. Some young people from the local community are happy to join our up coming activities regarding furniture and any other educational activity ( as sometimes it is fun to do something new especially here there is not much activities around ) Besides we can do something with the nearby school, either with kids, or a play ground wit bitcut or even connect it with the Internet. No projects started yet, all are postponed to start in February due to flight arrangement and or visa processes. The participants are arriving and we can start working on the projects, each project can coordinate internally using the dynlist and or other means of communication and report the documentation on the platform. Start our experience with the peer to peer curriculum, cooking, cleaning, sports, games, movies…etc and have fun. Every academy has a curriculum, and so do we Our is different though, as it’s all about sharing skills and knowledge we enjoy. Also, these are side activities beyond the typical project work, which is organized internally inside each project (but of course others are invited to join quite often). So, edit this and add either (1) what you would teach if there’s an interest or (2) what you would like to learn if there’s a teacher. Bicycle repair and maintenance. By @matthias. All the basics using bicycles from around for hands-on “case studies”. You should be able to maintain your bicycle all by yourself afterwards, including brake and derailleur configuration, fixing a wobbly rim with a spoke key etc… Don’t expect anything fancy though, as we only have basic bicycles and basic tools so far. Two sessions around 2 hours each. Building a mobile broadband router. By @matthias and [your-name-here?]. We will build a mobile broadband router to provide a backup Internet connection for the House. For that, we will use open source hardware and software as much as possible: a Raspberry Pi 3, Linux, a mobile broadband modem, and a self-made weatherproof enclosure and raised mount. One session of 4-6 hours, or two sessions of 2-3 hours each. Linux installation party. By @matthias and [your-name-here?]. You’ll install and configure Lubuntu Linux on your notebook computer, but you can keep Windows as well. Includes introductions to the programs you need to replace typical Windows software: LibreOffice, Inkscape, GIMP etc… 3 sessions of around 2 hours each. Working with photo spheres. By @matthias. A nice new feature with most recent smartphones, but it takes a bit of time to master it. This workshop shows ways to view the photo spheres on your own computer and online independent of Google software or services. We’ll also learn how to fix issues in the photo spheres with image processing software, and a hack that allows to capture a photosphere as normally with the Android camera app, but that processing the photos with open source software into a result with more than twice the resolution produced by Android. We’ll all take some photo spheres and work with these, of course. Alternative first aid without a kit. By @HadeerGhareeb. It will be over a session for an hour. 10 min: Introduction and safety. 20 min: Fixing a bone (arm / leg), theoretical and practical (ex. using tree branch, magazines / newspapers, jacket, belt, …). 10 min: Handling mild dehydration and heatstroke (ex. drinking 7up or Spirite to correct the electrolyte imbalance). 3D scanning with a camera. We would experiment, learn and practice to create 360° scans of objects using a smartphone photos, and sharing them as textured 3D objects online. We will use open source software as much as possible. Would be useful to document and share Bitcut results. @matteo_uguzzoni " I will bring with me a prototype I’m working on, is a tabletop game for 4 > 6 participant but in its simplest form could become a game for 12 people. I would love to run 3 to 4 playtest session during my stay (7th feb > 15th feb), each session is 45 minutes circa." proposal ; having a board game night on the 13th or 14th Feb, will be 9 people in house. 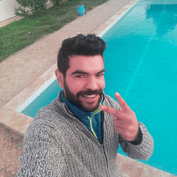 @AhmedMajdoub is interested in making improvised gym equipments to train with. @hazem : " I want to go and visit the nearby villages, my proposal is to take the micro-bus that passes by the house early in the morning till its final destination aka Sidi mubarak "
So surf boards starts on Feb not in January… Also why compress it in 4 days… We can take our time in researching for the right materials, best way in making the boards, make the necessary drawings before getting into making the board ? I will be free from 15th of Jan till mid May/june. I am flexible to join any project however would fit more with projects involve the local community. @HadeerGhareeb this is rather fortunate. I would like to see some project involving the local community, if this is compatible with the main goals. I dont know much about the comunity there but i was searching and found it is a rural area. If I can relate it to most of rural areas in the Arab countries, a group of newcomers coming and moving around will require an explanation enforced by involving them. I see that BitCut require a local workshop, Radio and storytelling as well. Moreover, the activities that were suggested will for sure help. I also found that when you work with their kids in a transparent way and impact them. They trust you more and the kids are the best advocator for you , this actually happened with me in a closed beduin community in Sinai before. Thanks for this @hazem - so exciting to see it coming together! As mentioned elsewhere, I’ll seed this with local Tunisian female attendees at next week’s camp in Medenine, with the intention of opening smooth pathways for ideas developed there to be prototyped at Sidi Kaouki, and that it can be a gender diverse space serving the MENA community. For now, I have set aside 4 - 11 February for setting up the Radio Kaouki project pending my travel can be included in the US$1500 mentor travel budget, and of course that there is space in the house. If you’re interested in my support in community/ business planning I could look to arrive a week earlier making it two weeks, or join in April on my way down to Ghana for the Africa Open Science Hardware conference. In any case I’ll await to hear from you on costs before confirming my attendance. On another note @HadeerGhareeb very curious to see how your project unfolds! Thanks for the important considerations. I confirm my arrival on 23rd of January. Thinking loud with you of what could be done with the community with the limited info I could obtain about the community so far…. Kids. I would propose integrating “trash into Toys project” in their system. Here is a link to proposal for a school describing the project. Women. Teach crafts and help in marketing it online / “Friday” Market. Health campaign about breast cancer self-check and proper nutrition for families. Hi everyone! 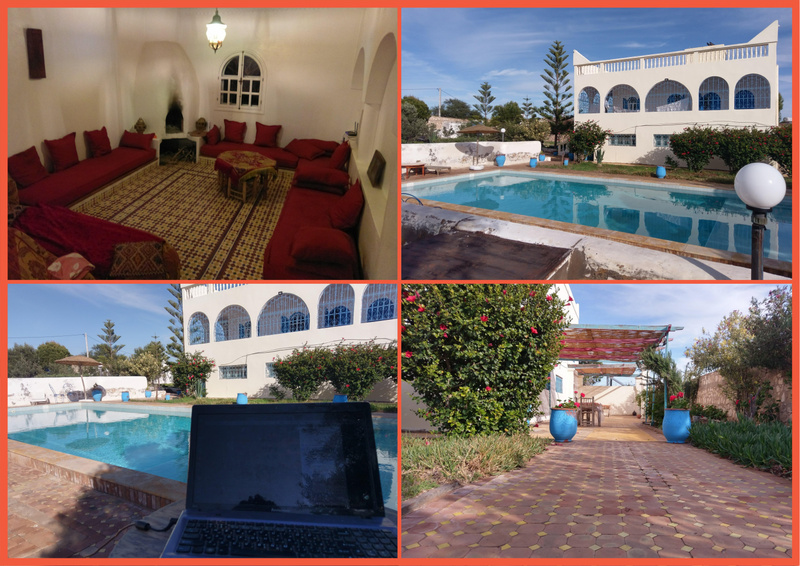 I’ll actually be working from Essaouira from the 1st to the 8th of Januari. Currently on a residency wirth Queens Collective in Marrakech. I’ve recently become involved with Edgeryders and have been working with @nadia, @alberto and others on Recode and will come by the house to say hi and help out a bit, I’m pretty good at carrying things back and forth. Will probably come on the 6th. Really looking forward to meeting you and seeing the house! For the record, looks like I will be over there to make the Academy video Feb. 6-16. I won’t be there that whole time - I need to figure out the specific dates and the best way to get there from California as usual balancing cost with reasonable comfort. It looks like flying into Marrakech is the best way for me because there are a lot of flights to London from here and then over to Morocco. 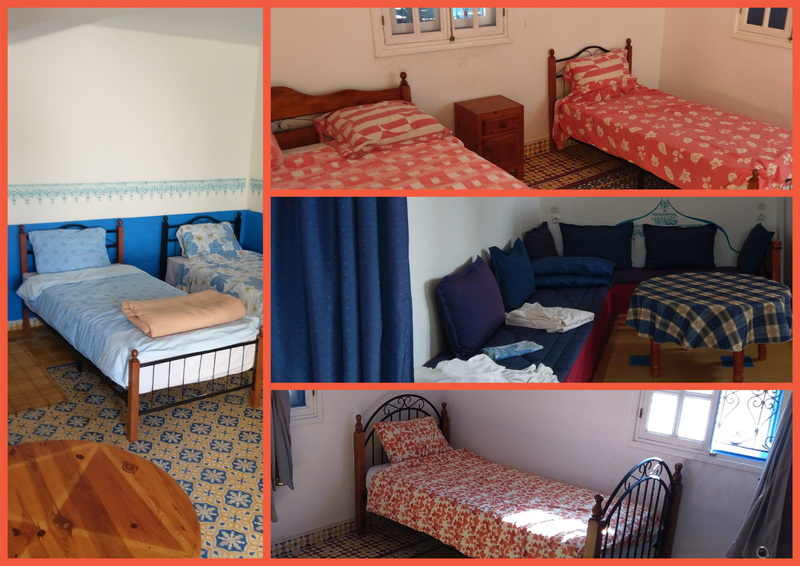 I read somewhere here that it would be most practical to plan to stay over one night in Marrakech and then take the bus to Essaouria and then over to Sidi Kaouki. Matt and Hazem, do you agree this is the best option, or do you advise I also look at other options? Easyjet fly from London Luton direct to Essaouria. It’s only 30mins on the train north out of london. I got a good deal on a flight from Oakland to Barcelona to Marrakech and back, so I will take the bus from there. Thanks. @hazem @matthias what is the best way of going about scheduling a few days stay at the house? I intend on coming by on my way back from the Africa Open Science Hardware conference around Fri 20 - Wed 25 April… Will be available to help out with thinking through next phases for projects towards the end of stage one. Lovely, I agree! Count me in.